I don't get sick very often -- maybe one or two days a year. But I've been fighting something simply awful for the last three days or so. (I'm pretty sure I caught it via Skype from Trebor Daehdoow.) Today, it made itself known in a big way. I knew I was in trouble when I did an editing pass on the same two paragraphs of the next blog post (PvP Basic Ship Fitting, by the way) three times without reading it. I knew I was in even more trouble given that I just drove home with all the windows up and the air conditioning off, and this felt normal. Hint: it's 35C in my little pocket of California today. Room temperature gives me the chills. So... yeah. Gonna go see if I can sleep this off. Back to normal operations tomorrow if all goes well. One thing you can say about the last year or so: it hasn't been kind to the MMO genre. Star Wars: The Old Republic started the trend, which has continued with troubles around Lord of the Rings Online and Guild Wars 2 and Rift, and the collapse of Kingdoms of Amalur before it could get launched properly. Smaller MMOs have also been struggling a bit. So it hasn't exactly been a friendly environment in which to launch an MMO lately. Hell, it can be argued that the last year has put a damper on MMO development in general. Certainly, Bungee is off working on Destiny, but that's been pushed to 2014. Chris Roberts is still sending weekly updates on Star Citizen, but that won't be out this year either. Which leaves only the small possibility that Neverwinter or The Elder Scrolls Online will be launched before the year is out. The former is moving into open beta, the latter into closed beta. As we roll closer to E3, it's likely that we're going to hear a lot about both titles. Neither of these games is any danger whatsoever to EVE Online. Now obviously, the latter game is the one I'm more excited about. The initial ESO trailer did very little for me. As a matter of fact, my initial reaction to it was "are you going to have any Elder Scrolls in your Elder Scrolls game?" But during the roll-up to E3 we're seeing more interviews with Bethesda Softworks developers and producers, and more game-play footage. And I'm pleased to say that the new stuff is getting the atmosphere a lot closer to the games I remember. Will it be any good? It has the chance. That said, it's looking more and more like we're going to get another World of Warcraft or GW2 clone, which is a shame. Four- and 24-character instances, a theme park opening story, and the other information being revealed this week makes me... well, it makes me sad. I knew that ESO wasn't going to be an open world sandbox style game like EVE... there have never been any promises made by Bethesda that anything like that was on the horizon. Still, Tamriel has always felt so open to me anyway that I think I was projecting more of my hopes onto it than would ever be reality. Given my commitments right now, it's probably for the best that I haven't been selected for the closed beta so far. And beyond that, there's a reason it hasn't appeared in the list of upcoming MMOs I want to play off to the right yet. I've played a couple of WoW clones already, and I've got very little interest in starting another. And I can't believe I just said that about an Elder Scrolls game of all things. I've been an ES fan all the way back to Daggerfall. Still, the new game-play videos do look pretty damn nice, and it's particularly nice to see a lot of the old races, environments, and special effects back in a big way. In much the same way that SWTOR was sold as "The Old Republic three, four, and five", I might have to devote a few hours to this one just to immerse myself in this world that I've been playing in for... wow... almost 20 years now. Yeah, I think I owe the guys at Bethesda that much. But there's a bit of a damper on my enthusiasm, if you know what I mean... Anyone else feeling this? Or is this game even on your radar? since they weren't, the militia plan was to leave the entire stack unlooted in the freighter wreck for up to two hours. Why do the latter? So they can pop the wreck and end the lives of those slaves, of course. But also to give the Minmatar role-players out there something to agonize over. Do you try to slip in with any sort of ship and save their lives? Or do you leave them to die slow agonizing deaths in the cold of a deep space wrecked starship? And with all of them in a single stack, you'd need a pretty significant ship to save them all... Quite the little dilemma, I'm sure you'll agree! And it makes for both an amusing kill-mail and a fantastic addition to EVE's lore. Loved it! Kudos to those that planned and executed it! Pretty funny, given Shadoo's most famous meme... There's a couple of good stories about this one on EVE News 24; TMC went with Elise's BRs. All four supers died on the same day, Thursday last, three of them CFC supers within minutes of each other in MC6-5J in Venal. First to die was this Goonswarm Hel, second was this Fidelas Constans Wyvern, third was this FCON Erebus. Again, both EN24 and TMC covered this one and not surprisingly, come at the fights from two different perspectives so for that reason, both stories are worth reading. EN24 takes the (mostly) Black Legion perspective, TMC takes the (mostly) CFC perspective. Short version as I understand it: Black Legion formed a massive dread fleet and decided to reinforce some Goon POSes to see if they could get a response or an escalation. They got both. Black Legion won in that they killed three supers. But they also lost 40 dreads doing it. It's a good trade... just. Certainly, I enjoy seeing supers die so kudos to BL on that score! Go ahead and read the stories to get the full detail. There's also videos. Good stuff! Also killed on Thursday in Feythabolis was this UnclaimedDOT Aeon, by a mixed group of Nulli Secunda and Kadeshi supers. The situation on this one is confused to say the least. Unclaimed is in the midst of a fail-cascade owing to alleged alliance leader financial misconduct so without first-hand intel (which I don't have), there's no telling how this one died except it was likely collateral damage of that. There are apparently stations changing hands with Unclaimed pilots still trapped there, POSes failing right and left... it's a bit of a charlie-foxtrot and not the orderly changing of hands that's become more typical in null-sec sovereignty. So role-playing, a goodly number of super and capital ship deaths, the fight in TXW that I already mentioned... pretty fun week in New Eden all in all! Let's hope the pace keeps up and picks up into the early summer! There's already an Avatar kill this week, but I'll talk about that next week. Since I'm in a battle report mood, let's do one more and then I'll go on to other things. Unlike my usual occasional BRs, this is one where Rote Kapelle lost, and lost quite badly. The kill report itself is very confused with three separate fights, so I'll have to explain the relevant bit. Scroll down some and you'll see that Rote lost four attack battle cruisers, a cruiser, a Scimitar, and a little pile of pods. The aggressors for this particular fight were a UsurperDOT Sabre and twelve or so stealth bombers, ten of them Hounds. The white figure in the lower left represents the stargate our fleet was warping toward. The red arrow at the top center points back toward the gate we were warping in from. Both yellow lines are 30km long. On the stargate was our scout. It's typical for small gang fleets to have a scout and for this scout to run one jump ahead of the fleet. In this case, a Sabre with a cloak (probably fit similarly to this Flycatcher FOTW from 2011) was sitting at the location marked by the bottom of the red arrow. As soon as he saw Local starting to fill up (with our fleet), he decloaked and launched one bubble (marked by the blue circle closest to the stargate figure). Then he began flying in the direction of the red arrow. At the edge of the first bubble, he deployed a can with one round of ammunition in it (the white dot on the diagram). He then continued along the path of the red arrow until he was about 7000m from his dropped can and dropped a second bubble (marked by the blue circle farther from the stargate figure). Meanwhile, our fleet was in warp. 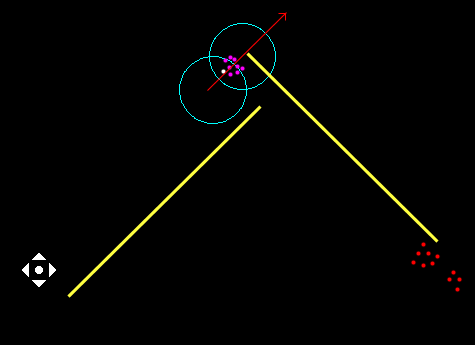 Bubble mechanics dictate that if a bubble is dropped before you go into warp toward a celestial and the path of your warp will cross the location of the bubble, you will land at the edge of it instead of at the celestial. Your inertia will then carry you a certain distance into the bubble defined by your ship's mass; heavy ships are carried farther. In this case, our fleet was relatively light attack BCs which were carried only a short distance into the first bubble. Our fleet is marked by purple dots on the diagram. But because the second bubble was launched to overlap the first, our fleet was fully enveloped. And that's when the first wave of bombers decloaked. They're the red dots on the diagram. They all start cloaked about 35km from the can, using their directional scanner to see our fleet come in. When our fleet appears on short scan (and once the Sabre's can is deployed), they align toward the can. When the can is a little under 31km away, they decloak and launch their bombs. The first wave of bombers is about seven ships, all with Shrapnel bombs. These seven kill two pods traveling with the fleet (don't ask), all the attack BCs and the Scimitar, leaving only a Rupture alive and badly damaged. As the first wave of bombers decloak, the second wave of bombers (four to five) align toward the can. As the first wave of bombs is about to land, they decloak (by this time also 31km from the can) and release their bombs. They kill three more pods and the Rupture. Meanwhile, the first wave of bombers warps off to the celestial that is lined up on the far side of their advance. The second wave of bombers follows them as soon as their bombs are released. Seven bombers is the size of a typical bomber wave, and all bombers must use the same type of bomb. More bombers in a wave, or differing types of bombs, and you risk the detonation of the first few bombs destroying the others. Bombs are highly resistant to their own type of damage and have no resistance at all to other types. So that's it: a more or less perfectly-executed bombing run. The hardest job is the Sabre's and this Sabre pilot did his job well. Comments? Questions? Additions? As you might have heard, Rote Kapelle was involved in an actual "big" fight and though I do not often do battle reports, I thought it'd be interesting to give my perspective on this one, since "I was there" and all that. One of Rote's long-time members has a thing for moons and moon income. It's even caused him to briefly seek his fortunes with a null sov alliance where that sort of thing is common. But in Rote it's definitely not. We typically have no more than one or two POSes at any given time, the most important of which is our staging POS in our home system. The vast bulk of our members have no interest in defending or attacking structures and view such things through one lens: "Will it get us a fight?" If the answer is no... not interested. That leaves this particular member in a bit of quandary. Anyone in Rote Kapelle can call a CTA; at any given time, there are four or five scheduled by various people in the alliance. But the typical attendance is between five and 15, since that's the typical fleet size we run. That's generally not sufficient to attack or defend a POS. Still, if you have enough alts and enough dreads and enough brazen courage to attack a small Goonswarm POS with your own alts and a few friends, you're free to do so, have it generate a reinforced tower timer, and CTA for that timer. So that's exactly what happened. Over on the Goon side, very ironically, it appears the same situation was happening. A single Goon FC has a little miniature moon fiefdom going. And this particular small tower and its moon belonged to him. So he gathered a small dread fleet of his own... and reinforced the main Rote Kapelle staging tower in our home system, which up to that point had never been shot at, much less reinforced. So now we had two CTA timers. Only this time, the bulk of our alliance expressed interest on the forums in showing up to defend our main POS since intel reported that there was a near-100% chance that this Goon FC would form up a fleet to finish it off. When CCP Seagull talks about "instigators", this is what she's talking about, and it doesn't have to be someone who instigates a full-on null-sec war. You can have smaller scale instigators and enablers, and that's what we had here. The night of the op arrived and soon our TS filled up with something like 70 Rote Kapelle members, more or less the biggest assemblage our alliance has seen since I joined about 18 months ago. It was sort of a reunion party. Still, the bulk of the alliance was instructed not to actually log into EVE since we wanted to hide our numbers and have no more than 20 or 25 people in Local when the Goons showed up. A few of us were asked to log in POS gunners and sit inside the shields. Everyone else was told what the fleet comp would be (armor HACs) and told to be ready to hop into one and from there into the waiting fleet immediately upon being told to log in, so that's what we did. Was there spying involved? Probably. I wasn't part of that. But it meant that the rank-and-file fleet member had no idea that Black Legion was going to show up. Our plan was to hide our numbers, log in en masse, use the confusion of tripling the count of Rote people in system to break out of any camp that the Goons tried to establish outside our home station, then go in and see if we could knock down a few capital ships. Any cap kills we inflicted would, in our view, more than make up the loss of our POS. And so we waited, about 25 of us logged in, plus a small group of Usurpers that we assumed were bombers (this later proved accurate), plus a few other randoms on both sides, bringing the local count to about 60 or so. In due course, the Goons and their allies started jumping in, more than 100 strong, bringing the count to about 165. There was a little bit of shifting of assets on both sides and the fleet was told the Goon support fleet comp: shield, Drakes and Cyclones, lots of logi, lots of tackle. As I've mentioned on this blog before, Rote's idea of an armor HAC fleet tends to run pretty strong into tech3s. We were ordered to log in, get into fleet, and get into ships and in the end we undocked about 65 strong, about one third of that Lokis, Legions, and Proteii. I personally was in a Legion. Despite initially not thinking much of them, it has quickly become my second favorite tech3 after my much-loved Lokis. That pushed Local to 200. The good news: it took us only a couple of minutes to get logged in, into ships, fleet assembled, and undocked. As we did it, the Goon caps landed on the POS and started shooting. The Rote POS gunners picked our primary and went to work. Sure enough, the Goon sub-cap fleet was positioned to try to prevent us leaving the station area but clearly weren't ready for our numbers to triple and we caught them a little by surprise, knocking down ten to fifteen of them very quickly to about three losses on our side. As is becoming Rote custom for this sort of thing, we disdained logi in favor of triage carriers. From this point, things started happening really fast. Almost simultaneously, three things happened: the Black Legion caps jumped in and started engaging the Goon caps, the Goon sub-cap fleet was called in to defend their caps, and we rolled in behind them after killing a few Goon stragglers on the station, leaving behind one of our triage carriers still in mid-cycle. Break-out of the station camp, successful. Local count: 265. Once on the POS, our fleet really settled down and started smiting the Goon sub-cap fleet, wiping out nearly all of their support fleet with almost no friendly losses except the POS itself. And that's already replaced, etc. etc. But kudos to Goons for staying on the strategic objective even under fire from Black Legion. Meanwhile, the Black Legion guys did a great job attacking the Goon caps while the Usurpers came in and randomly bombed both sides from time to time. The results to the Goon cap fleet, you've already read. Lots of dead ones, but a lot of them did get out alive. Following a bit of looting (complicated by the aforementioned heavily stabbed bombers), we had about an hour of AAR discussion, talking about what went right and wrong. Overall, I was personally thrilled at how we did. Yeah, the POS was lost but it bought us a terrific fight. The biggest mistake we made? Everyone on our side killed should have come back in a dictor and started high-speed orbits around the Goon caps to ensure that none of them left our home system alive. Live and learn. As it was, a number of Goon caps got out, their pilots probably wondering just what the hell went wrong. Isn't this little NPC null-sec alliance bad and friendless and alone... therefore that's why they live in NPC null? Whereas the truth is there are lots of people that will form up explicitly to fight Goons regardless of circumstances. Looking forward to more fights in the future. I'm going back to Delve for now, Test is a lot more fun to dunk on than welping drakes into tech 3s. Anyway, just my perspective of what went down in TXW-EI on Thursday night. For one day, my little alliance had the biggest fight in New Eden... and it was a blast. Come back soon, Goons! (1) This post is also hysterical. This is about as basic as it gets for a dreadnought fit. You can obviously start with a T1 siege module as you train up for T2, but the T2 module is so much better than T1, you should definitely make training for it a priority. It adds about a 15% damage bonus. As a result, in terms of training order, I recommend Gallente Dreadnought III, then Tactical Weapon Reconfiguration II, then Capital Hybrid Turret III. That will get you very basic competence. Then Dread IV (adding 11% DPS or so), then Tactical Weapon Reconfiguration V (adding 15%), then Capital Hybrid Turret IV (adding 5%), then Dread V (adding 11%), then finally Capital Hybrid Turret V (adding the last 5%). All of that assumes you want a perfect dread pilot. If you want to be a bit more balanced, you can stop at Dread IV and Capital Hybrid Turret IV. But if you do take it all the way, then in this fitting, you'll be doing about 11500 DPS with standard ammo and 12700 DPS with faction ammo. A third faction MFS adds about 250 DPS. CONCORD guns add about 400 DPS per gun. In the end, it will come down to the amount of ISK you want to put at risk. Since dreads rarely come under fire and those that do frequently die regardless of tank, you can even go with a damage rig if you like. Fully maxed out, you'll approach 15500 DPS... not bad at all. Dreadnoughts generally operate "in siege" which should be the topic of a separate blog entry. But for the purposes of this one, siege lasts five minutes and is the only way you should operate dreads in serious combat. During siege, you will be unable to move, jump out, or warp. But your damage is hugely enhanced. Outside of siege, you'll be reduced to about 1300 DPS... you may as well bring a battleship instead. Tank is provided by two EANMs, a damage control, and a single capital self-repair module. You cannot receive remote repairs while in siege. This tank is primarily intended to provide sufficient buffer and self-rep to safely attack a POS defended by large guns. It will provide you with some 2.0 million EHP of which about 350k HP is armor at an average resist of 66%. While this sounds like a lot, it really isn't. A single enemy Moros in seige can destroy you in about three minutes, and ten of them can wipe you out in 20 or 30 seconds, barely enough time to get a few cycles of this repper off. So while it may make you feel better to have it, don't kid yourself that it's going to do much. If you're put into this situation, the repper is there in case the additional seconds of life it provides are enough to get you out of siege and into the arms of a nearby (hopefully triaged) carrier. You can extend these seconds fairly significantly by springing for faction EANMs for the extra resists or having a Damnation or the like in your fleet. Otherwise, as I said, the repper primarily exists to mitigate POS gun damage during a POS bash. A dread in siege can only lock a tiny number of targets (two with a T1 siege module, three with a T2 module), and locking targets takes forever without a Sebo (30 seconds to lock an enemy dread while in siege), so a Sensor Booster is more or less mandatory. It will somewhat lessen your pain. ;-) Two Tracking Computers is more or less also a requirement for armor-tanking dreads. The remainder of the mid slots are dual Heavy Capacitor Boosters. These will keep your guns firing under the heavy neuting which often precedes you becoming the enemy fleet's primary target. The Moros's cargo bay is enormous, so carry 800s and don't skimp on extra charges! The cap boosters will also help tremendously during a capital fleet's egress process: you can use them to "cap back up" quickly after coming out of siege, since you won't be able to use your jump drive until your cap is above 70% or so (assuming Jump Drive Operation V). It's a great idea in a Moros to keep boosters in cargo, as well as several hundred units of nanite repair paste. Good choices for boosters are Mindflood (for additional cap), Frentix (for additional optimal range, though this one is going to become less important), Sooth Sayer (for additional fall-off; this one is going to become more important), and Drop (for tracking). Since dreads operate exclusively in low, null, or w-space, if your dread pilot can handle them, I recommend Standard boosters, if not Improved boosters. One of each of the ones you want to carry will probably be sufficient. a full set of T2 active armor hardeners. Similarly, if attacking a POS or structure, you can remove the Heavy Cap Boosters and replace them with Cap Rechargers. Once the operation is over and you're capping up for the jump out, replace two low slots with Cap Power Relays to cap up more quickly. If your fleet comes under heavy attack and you become an enemy fleet's primary, trade out your MFSs and one EANM for the full set of hardeners to increase your chances of staying alive (or at least to slow the enemy fleet's DPS down). With time and practice, you'll become quite good at swapping out modules on the fly and adjusting for the situation you find yourself in. In particular, if your fleet is attacked, make sure you get some resists back into the lows and the cap boosters back into the mids. You'll need them. So here's a quickie that's also philosophical. I'm in a philosophical mood this week. EVE is often a bit of a "mystery box", or just a plain old black box. To learn definitive things about the game, often the player has to feed it a lot of inputs, see what comes out, write the outputs down, and then try to reverse engineer what the game is actually doing based on this data. There's certainly no documentation and because of game updates and the like, sometimes even the documentation that players have come up with is wrong. I'm sketching out outlines for the next few PvP guides, one of which will be basic electronic warfare. Those of us that do e-war have always had the impression that e-war strength drops very rapidly outside of optimal range. But to my knowledge, it's never been officially documented just how much. In CCP Fozzie's XL guns thread that I referenced last night, CSM member mynnna and many other EVE players are having an argument about missile speed versus explosion velocity versus ship velocity versus explosion radius and how those factors interact. In both cases, there's no definitive source that I'm aware of that has a canon answer. So players end up endlessly debating these and other subjects that are tied to the underlying mechanics of the game, which exist in the black box but are otherwise undocumented. Net it down to its most basic level and you get "EVE is hard to learn and is hard to explain." This is just one of the reasons. Here's the philosophical bit, and the bit that I'm very curious to get some player input on. I've blogged endlessly on the difference between needless complexity in EVE and complexity that adds to EVE's rich game-play. Which do you think this is? When you have to endlessly debate how missile explosion radius interacts with ship signature, is that adding to the richness of the game? Or is it complexity for the sake of complexity that should be simplified or removed? In my opinion, someone very smart needs to take EVE's combat system, break it down and flow chart it, simplify it, and rebuild in a similar fashion to what was done with Crimewatch. Again in my opinion, most of the rich complexity of EVE comes from how the combat system is applied, not the mechanics of the combat system itself. It wouldn't reduce the richness of the game at all if I could explain EVE combat in simple terms. Again... in my opinion. But wait just a second. Before you answer, here's the really tough part... before you answer, remove from your head any thinking you have in terms of "EVE is hard, I had to learn it and it took a long time, and if newbies don't want to do the same, screw 'em." Because I'd like to hear your answer outside of that tendency that EVE players have to want to torture other (particularly newer) EVE players. Just look at the problem at its most basic, as if you were designing the game from the ground up. Does EVE's black box nature add richness to the game? Or needless complexity? Discuss. First, the news of the day. I don't have much to say about the launcher issues that happened today except these things happen. Matter of fact, I had been telling CCP devs this past weekend how nifty I thought the new SSO launcher was on Singularity and playing with it there. It didn't cause any issues getting it installed there and from what I'm seeing in CCP's news briefs today, it looks like the issues today were mostly coincidental. Here's the forum thread if you want to read it. It got to 103 pages in about 16 hours. Am I going to rage to CCP about it? Nope. I'm sorry about all of the people impacted by this issue. I was impacted by it myself and spent a while on a work-around before figuring it out. Software has bugs and unforeseen problems from time to time. While I understand the anger, I don't share it, and I'm not going to get on CCP's case about it. If you're going to get annoyed with CCP, get annoyed with them for stuff they do on purpose. ;-) Onward. I happen to disagree with his order. I think the Naglfar will be passing the Revelation thanks to several factors which I'll get to presently. But those of you posting "RIP Moros" or asking if you should still train the Moros aren't thinking the issue through. The simple fact is that the Moros is so much better than the other three dreadnoughts right now that only a major top-down re-balance of the entire class is going to address the balance issues. While, say, adding 25% to the damage of capital missiles would be satisfying to Phoenix pilots, without balancing the rest of the ship, the Phoenix is still going to be wildly sub-par to the other dreads in virtually every respect. Fozzie, CCP Ytterbium and CCP Rise are smart guys and know about the problems. Hell, I wouldn't put it past Fozzie to do it this way on purpose. And no, I haven't asked him. He's such a nice guy he might tell me the truth. Better damage output for what a lot of people actually use dreads for, i.e. small-scale cap fights and structure bashes. Opens up the terrifying possibility of blap dreads used against other capitals. Few/no cap dependencies actually makes them tougher in combat. (Once things settle down.) Cheaper. In particular, in a good armor tanking configuration, a Naglfar has 1.9 million EHP on 326k armor HP, versus 2.0 million EHP on 310k armor EHP in a typical Moros. But unlike the Moros, your guns can't be capped out and are tunable to whatever damage type you like -- that includes to the explosive hole that most POSes these days have. The Nag has 82% resists against Revelations, and 70% resist against kinetic. And finally, once hull prices stabilize, I predict Nag prices are going to settle down at something around 2.4 billion ISK... and if you fit CONCORD guns, you only need two of them. But the Moros is still better. 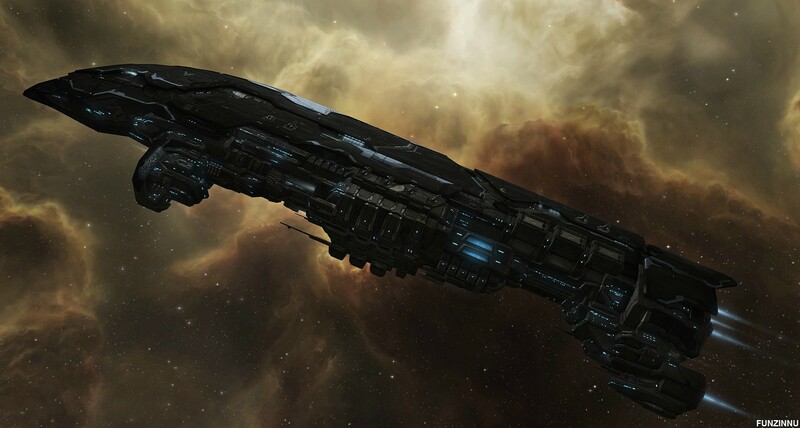 Typically in EVE, dreads attack structures; a large POS attack takes place at 30km. A typical Moros fit for this task with triple faction Magnetic Field Stabilizers, CONCORD guns, no Tracking Enhancers and an expert pilot aboard does about 15500 DPS at 30km. His optimal with anti-matter will be 27km, meaning that the vast majority of shots at 30km are going to hit and hit hard. With a 30km falloff, DPS drops to 5000 at 57km. With this change, optimal will drop to 17km, but fall-off will be extended to 40km. That means damage at 57km is going to be about the same and the DPS curve will drop more slowly. Today with this ship, you lose about 2000 DPS 10km beyond optimal but with the longer fall-off I think we can expect the loss with anti-matter at 30km to be no more than 1000 DPS or so, to about 14500. Yes, you can downshift to Plutonium and yes, that will certainly help. But I think it's going to drop your DPS to about 14000 at 30km. In short, anti-matter still looks to be the way to go. Yes, more of your shots will miss. But the percentage that will miss will be made up by the increased damage of those that hit and you'll still be coming out ahead in structure bashes. And you're still going to be exceeding Naglfar and Rev damage except under very specialized situations. I can't speak to capital-on-capital fights, having only been in a handful of them, but in my experience those take place at much closer ranges than 30km and so this change isn't going to affect the Moros at all. What about tracking? Obviously, the 15% tracking nerf that XL blasters is receiving is aimed at the famous "blap dread": Moroses fit with double tracking computers intended to slay webbed-down battleships in large fights. Again, having run the numbers and thought about the situation, I conclude that the nerf is not going to be sufficient to end these tactics but can't be made any higher without impacting the occasional Erebus gun-fight. In particular, the heavy webs often brought to bear in this situation have more of an impact on the targets than the tracking of the dreadnought itself does. In short, it's not much of a nerf. It addresses some of the issue and might cause a Moros pilot here or there to fit faction Tracking Computers. But it's not going to put an end to the tactic. A full rebalance of the dreadnought is going to be needed to address this issue as well, in my opinion. So anyone breathing into a paper bag over this can relax. The Moros is still the best dread and is likely to remain so for a while to come yet. Anyone who spent a lot of time training them can be confident in their training, and anyone asking which dread to train? There you go. Reading reading reading reading reading. Trying to stay ahead of EVE Online forum posts, private chats, Skypes, Twitter, EVE mail, pod-casts (though that's not reading, of course). This CSM thing continues to be an enormous amount of work! And thank you to all of you that have taken the time to drop me a line or send me a comment! As always, there's some fun stuff to share. The rest of the CSM has apparently started a pool: how long until Ripard NDA-blogs himself right off the CSM? Let's hope it's next May. Anyway, all of us on CSM8 had ourselves a grin at this initial TMC article, particularly because several of us had already been interviewed or contacted by Rhavas for a more definitive CSM8 officer article. He was quick to reassure us that Set's article wasn't it. I have to admit, though, I had a personal amused moment. I suspect my feelings when I read Set's article were mirrored by Seleene, Alekseyev Karrde, and a few other members of CSM7 from time to time when I would write something. Ah well. Rhavas's article came out the 17th and is terrific. I strongly encourage you to go out and give it a read. It's the clearest possible picture you could get of how the officer selection process went. There's pretty much nothing I would add to the article and the quotations from me are accurate and sum up how I feel the officer voting went. So go give it a few minutes of your time. I want to compliment Rhavas on a fine job here! Currently going through the five stages of grief is Poetic Stanziel. He's currently somewhere between "Anger" and "Bargaining." His article "It is time to get rid of CSM titles" is an absolute riot! This blog post can be roughly summed up as "Trebor won a Grammy?! This proves the Grammies are freaking worthless. End them. Now." At one point, Poe indicates there have been few or no CSM officers that have done anything worth a damn in the positions. I dispute this in the strongest terms. Anyone who doubts Mynxee owned that Chair title is flat wrong, and TeaDaze was the finest Secretary any CSM has ever had. And that's just two people that jumped into my head reading his piece. Onward. I'm hoping to announce the date of the first CSM Town Hall in a couple of days. Many of the CSM have agreed to my preliminary schedule for six town halls this year. I want two town halls each on either side of the two summits, one during the mid-summer lull in CCP activities, and one during the run-up to the CSM9 election. I'm also building up support for the monthly "Features and Ideas" meeting that I mentioned last week, with buy-in from a number of CSM members and (this week) a couple of CCP devs, interested to see what we up-vote. Ali Aras has been running a series of "Space Hangouts". Check out her G+ page for details on that, or it'll be on her blog very soon. She also did a pretty interesting analysis on the CSM8 voting trends. Note to self: get the CSM8 bloggers into the "Infrequent but Important" section of this blog. Document any open switches that CSM7 had with CCP in terms of promises made. Document any issues that CCP had asked the CSM to follow up on. Document anything either from CSM7 or from past CSMs that CSM8 should hold CCP accountable to. Document names, CCP names, and titles for CCP devs and generally list which ones are good contacts and for what. This is going slowly but well. I need to push on it a little more. Hans Jagerblitzen and Alek also continue to be a help here. A bunch of us have also now been invited to an alumni CSM channel where we can chat with other past CSM members (and they can laugh at us). Several CSM members appeared on pod-casts this week, and mynnna and I were invited to chat a little bit about CSM at the Syndicate Competitive League tournament. My big pod-cast appearance this week was on Podside (Mike Azariah is a co-host there). I'm pretty sure I was episode 104. It was pretty late at night and by the end I was a bit punchy and profane. Sorry about that... if you're looking for a totally classy CSM rep, it wasn't me. ;-) But it was a damn good time regardless and I got to talk about our activites a good bit. Kesper North will soon be putting up a forum thread with contact info for all CSM members. Lots of good discussion on the CSM Skype channels this week about various Odyssey topics! You can probably guess the two items that took most of our time. A decent number of CSM members and ex-CSM members got themselves killed in-game this week. That prompted me to joke that I wanted to be the first CSM member to shoot and kill every other active CSM member. Then I was reminded that the mains of two current CSM members are currently sitting in titans, which could make that problematic. ;-) Still, might be interesting to try for the record. I wonder what the record is? Finally, CSM got its first bit of homework over this weekend. A CCP dev that shall remain nameless asked for information about how to learn how to do T2 manufacturing... in game. I have to admit that this made me laugh and I teased the dev in question about it for about an hour while his screen filled up with info windows. I finally took "pity" and pointed him at the little basic T2 manufacturing guide that I wrote earlier this year. His response to it was quite amusing and probably under NDA; you T2 manufacturers like me can probably imagine it. But he paid me back for the teasing and the wall of text with a homework assignment: give him some proposals for making T2 manufacturing more understandable, particularly in-game. He's also given me permission to run a player round-table on the subject, so that's exactly what I'm gonna do. Look for that to be set up in the next week or so. Feel free to start commenting on it now, though! First thing that occurred to me? How about a random 2-run T2 BPC for completing the industry tutorial? First thing that occurred to Alekseyev Karrde? A "Variations" tab on T1 BPOs and BPCs, pointing to their T2 versions. I think both are pretty good ideas: they show newer players what's possible. But I'll be looking for other good ideas, from you. Yes, you! Little bit of Sunday geek philosophy for you. One of the most basic tenets of journalism used to be that you don't write a story without the "five Ws": who, what, when, where, and most importantly, why. Who did it? What did they do? When did they do it? Where? How did it happen? Why did it happen? That last question speaks to motivation and is often the toughest question to answer, and usually takes the longest. As a result, modern news organizations have gotten into the habit of going to press with as many of the questions answered as they can. These days, Woodward and Bernstein are afraid of losing their access, and CNN doesn't want to lose the "breaking story" to MSNBC or Fox News, so journalists "go to press" as soon as they can string some kind of coherent narrative together. This particularly applies to things like terrorist attacks. When something awful like this happens, you will know where, when, and to whom it happened, but only usually will you know what happened, often you won't know how, and almost never during those initial few hours will you know why. Those things come a lot later. But in today's 24-hour news cycle, the five Ws have diminished in importance in the view of many journalists. The slow degrade of respect the public has for the profession can probably be traced in part to this process. There's just no time to get the full story if you want eyeballs in front of screens. You go with what you have. Sometimes the choices are even harder. Sometimes you find out why a terrorist attack happens, and it's from the terrorist himself. Do you go to press with that information? Do you turn your entire media empire into a mouthpiece for the thoughts of someone motivated by hatred or revenge, even for a moment? It's a tough call. Journalism schools debate it. It comes down to motivation: if someone has good information that answers a "W" but also clearly has an axe to grind, how much play do you give them? Not all such motivations are negative, of course. I'm sure we've all heard or read stories about someone committing a crime, only to have a family member come forward to defend that person or try to provide explanations, or information. Or a government official comes forward and tries to bring clarity. But often, the motivation is highly negative... revenge or contempt being quite high on the list. Again, how much play do you give that? It's another thing journalism schools debate. Now suppose a journalist screws up. Is that in itself a story? If so, who covers it? The journalist's employer? Another media outlet? How do you cover it? There's a great scene in Tomorrow Never Dies with one cable outlet gloating at the misfortunes of another. You don't want to do that! But if a journalist leaves one media outlet and joins another, for cause... and wants to talk about his or her former employers. Do you cover that? I mean, it's news, right? Yeah, let's tie this stuff to EVE Online. For those not keeping track, there's a little slap-fight going down this weekend between EVE News 24 and themittani.com. The genesis of the slap-fight was this article published on EN24, on May 13 (remember that date). Make no mistake: the article itself is kind of a mess. But it includes Jabber logs that seem to show CFC members -- including CSM8 member mynnna -- gained access to data on the EVE Online Chaos test server data on changes that were upcoming in Odyssey before those changes were announced. Further, the logs included indicate that the CFC used that information for massive financial gain, buying materials like isotopes that Odyssey is going to make more rare. Assuming the logs are legitimate, "what" and "where" is covered, and "who" is somewhat covered. The files are dated in the three days before Fanfest -- before mynnna was even on the CSM -- so "when" is somewhat covered. "How" and "why"? Well, the source of the data is a muddled mess. And the motivation for the original article goes back to Cerebral Wolf, who rather famously got himself blapped from Goonswarm for apparently trying to influence DUST 514's CPM through intimidation and blackmail. Whoops! And now he was providing Jabber logs about CFC activities related to EVE's Chaos server and Odyssey. Oh dear Heaven... that source doesn't have credibility problems at all, does it? It certainly raises a question about motivation. Now let's be clear here: I don't have a dog in this fight, and anyone who thinks I do is wrong. EN24 has agreements in place with six or eight bloggers, of which I am one. From time to time, EN24 syndicates our stuff Huffington Post-style, and we get ISK for it. I don't write for EN24, I don't do news for EN24, and I don't have access to any EN24 systems. That's about the extent of my involvement here. But I've talked with EN24 editor riverini on any number of occasions. And his long-held bias against anything CFC is probably one of the worst-kept secrets in New Eden. And here was Cerebral Wolf feeding it. So riverini -- probably eagerly -- asked Incindir Mauser to look through the Jabber logs, see if there was anything interesting in them. And apparently there was. And Mauser wrote up most of that disjointed little article about it. And then at that point, the story splits. Remember the old saying about how there's three sides to every story? This is where the slap-fight starts. What actually happened? Here's Mauser's version. Here's riverini's version. Yep, two whole featured news stories about who did what to whose EVE news website or news articles. And the funny and sad thing is that this whole story is built on questionable motivations. And the ironic thing is that everything that happened came down to a lack of communication. Mauser says that riverini fished his article out of the trash. How did it get into the trash? As far as I can tell, Mauser used his access to the EN24 tools to publish the article, on May 11, on EVE News 24! But then, because of cold feet or second thoughts or just a mis-click, then he deleted the article, then he apparently decided to talk to the Goons to validate the Jabber logs. We have pretty good evidence of this because someone commented on the piece before Mauser could delete it. It's still causing a glitch, right now, in the EN24 comments system: trying to read comments via the sidebar on the May 13 piece are getting redirected to the published, then deleted May 11 piece, where they obviously don't exist. Mauser did the correct thing, and went back to Goons to get the Jabber logs validated. Only first, he published his article. Then he deleted his article. Then he didn't send an e-mail to riverini saying "Hey riv, I've deleted the Chaos test server article because I want to fact-check some things. I'll get back to you Monday." But Mauser doesn't mention any of this in his slap-fight article because that clouds his motivations... the all-important why question. If Mauser isn't the victim, that makes his "riverini wanted to promulgate his twisted, weird, little agenda" story a little bit... unwieldy. riverini logs into EN24 whenever it is he does. The comment on the non-existent May 11 piece is causing glitches in the comment sidebar. He traces the comment to Mauser's deleted article, un-deletes it, edits it, republishes it. Why? riverini's motivations are also cloudy. Maybe he thought Mauser made a mistake with a publishing system he was unfamiliar with. Or maybe riverini just couldn't let a good article sliming the Goons go. He says flat-out he wanted it published on Monday, a high traffic day... again, motivation. Here's what riverini also didn't do: he didn't send an e-mail to Mauser saying "Hey Mauser, your deleted article is causing problems. Did you mean to delete it? What's going on?" riverini has added an addendum to his piece making that clear. So the motivations of all three people involved here are cloudy to say the least. The lack of communications is manifest. It isn't the first time that EN24 has jumped into the fray supporting someone with questionable motives. And TMC has also jumped into the slap-fight with both feet, hiring Mauser to be a staff writer despite his first piece being full of anti-EN24 venom. It'll be interesting to see what Mauser produces for TMC. In the meantime, all of the spilled ink has clouded the issue of the Jabber logs themselves. Remember them? They're legitimate. Neither side has disputed that. So the whole thing is a lot of sound and fury, signifying nothing, IMO. But interesting from a philosophical point of view, don't you think? Discuss. About once a year, I have to write a major mea cupla blog post. Welcome to this year's. Well, at least I hope it's this year's! If you write 500 blog posts a year, mistakes -- major mistakes -- are inevitable. When I make a mistake, I always try to be diligent about first, correcting it, and second, owning up to it. But I thought it'd be interesting to delve into this one in detail. First, the mistake itself: in the midst of a little QOTW post earlier today, I said that the Odyssey feature of Personal Hangar Array module for POSes was going to be delayed to a point release. That was mistaken. For those who want to gloat at me, feel free to gloat. I feel completely awful about this error, and have fallen on my sword to CCP. It was a stupid thing to do. When I was just a blogger, making a mistake like that is dumb but forgivable. But for a CSM member, it's a lot more dangerous: while this blog is not an official communications medium, it'd be real easy for a mistake like that to go viral. So I really need to be more careful about what I print here this coming year and that's why I feel so terrible about this early screw-up. So I want to extend my apologies to CCP and specifically to Team Superfriends for this error. If you want to know the story how this error happened, read on. It might be of interest to EVE bloggers or potential EVE bloggers. If you don't care, then you can move on to the next post. Anyone who has read my blog for any length of time knows that once a month, I do a little post that I call the "Junk Drawer". The junk drawer is really a side effect of how this blog gets created. To create the blog, I have a little mind-mapping application where I take daily notes on things that I read about, see in the game, hear about, or whatever. Some of those little notes get expanded into outlines, and some of those outlines get expanded into full blog posts. At any given time, there are a hundred or so "active" items in my notes, of which about ten of them are a paragraph or two (more about these in a second), three of them are outlines and about four or five more are blog posts in the process of being written. Anything that doesn't make it into at least an outline in 90 days or so ends up in a junk drawer post. And that's how those posts get created. In particular, sometimes the notes themselves aren't big enough to generate full blog posts by themselves. So they sit as a paragraph or two waiting to be connected to something else. Sometimes when this happens, those two paragraphs go into the junk drawer and that's it. But other times, I like to connect those two paragraphs to two paragraphs about something else if I can find a way to link them. This month, I had written three paragraphs about MSCW that I thought would be interesting, but they didn't really warrant their own blog post. We unfortunately will not be able to get Private SMAs into the initial Odyssey release. It is still something we want to do, possibly in a point release. It's short-hand. DP is dev-post. NBD is exactly what it sounds like. Usually, I attach the link next to it but for some reason, this time I didn't. This would prove to be a major mistake. Still, it wasn't enough to warrant a blog post of its own and hell, if I had gotten to the end of the month, then I would have realized that the line was wrong and I would have deleted it and no damage done. Scary truth: sometimes this happens. Odyssey is about finding things in space and things happening to you there. MSCW might cause features that didn't totally fit that theme to be delayed. What features have been delayed from Odyssey? Into the mind-map I went looking for the word "delay". And that's how a screw-up on a blog happens. When I connected those three thoughts, I thought the resulting blog post was very clever! Sometimes, it's when you think you're being clever that you're really not. So now you know how that screw-up happened. And knowing is half the battle. The navy battleships have a weird distinction for me in my play of EVE Online: at one time or another in my career, I have owned and flown every single one of them. That's not a claim that I can make for any other group of ships in the game. (1) They're not my favorite group of ships in the game -- that distinction goes to the battle cruisers, and T2 cruisers after them. But navy BSs are such ferocious ships, and relatively inexpensive for how good they are. That makes buying them an easy choice for me. So I was obviously delighted when I heard they were going to be rebalanced for Odyssey. Ah yes, this makes me remember to tell you guys something that should make you happy - we're going to increase calibration on all Navy Ships from 350 to 400. While it makes sense for Tech2 hulls to have less rig sots due to the specialized nature of the ships, Navy hulls are supposed to be an improvement over Tech1, but is not always the case right now due to rig / calibration restrictions. I cannot possibly express how happy that makes me. There are several ships that are going to benefit hugely from that, notably the Navy Raven and Dominix, both of which lose access to excellent fitting options thanks to their current 350 calibration. Kudos to that change! As for the changes to the ships themselves? All eight of these ships are being fundamentally improved and with a couple of exceptions, I'm pleased with all of the changes. I catch flak sometimes when I classify ships as "losers" (sorry about that, Hyperion) in these re-balance posts but keep in mind when I buy a car, I'm not comparing the 2013 Honda Accord to the 2012 Honda Accord... I'm comparing it to its 2013 competition from other makes and models. And by that metric, all eight of these ships are winners. Just some more than others. ;-) So I'm going to list them in the order that I'm looking forward to flying them. #1: Scorpion Navy Issue. Good Heavens, this thing is a monster. It picks up an additional low slot (like the T1 Scorp) and even more base shields. That, combined with the cruise missile buff and the calibration buff, vaults this one right to the top of the navy BSs. PvPers will have their choice of a full T2 torp fit, plus a heavy neut, MWD and MJD, or whatever CML fit they want. Shield brawling battleship gang... it might actually become a thing! PvEers -- particularly incursion-runners -- have to be smiling ear-to-ear about this one between the large amount of extra damage, calibration, and CML speed. The SNI is almost too good. #2: Typhoon Fleet Issue. In a way, this is a bit of a troll, the Typhoon Fleet Issue slipping right into the Tempest's old role as a fast, nasty battleship with high DPS and two utility high slots. Know what? Don't care. Like the T1 Mega, we're going to be seeing a dozen fantastic TFI fits each better than the last, some shield, some armor, all awesome. In particular, the Tempest never had that 125m3 drone bay. #3: Raven Navy Issue. That stuff I said about the SNI? It also applies to the CNR. PvPers will be using the extra mid to fit a MJD, and their buffed cruise missiles will be outrunning and spiking interceptors, particularly with Precision loads. That's scary stuff. Torp CNRs are also going to be fun as hell. And you L4 Caldari missioners that aren't in this boat starting with Odyssey will be doing it incredibly wrong. "This ship is going to be an animal," Rise says. Yup. #4: Armageddon Navy Issue. With the T1 Geddon getting bounced around, the "Neddon" vaults for me into the position of the preeminent brawling battleship. Biggest changes are the increase in sensor strength (Neddons have always been vulnerable to jamming out their already huge DPS) and base armor. The latter should make a 200k EHP Neddon quite achievable... which will still be doing horrific DPS at close range. The upsized drone bay is quite nice (though I would have been happer with 250m3). I've had an occasional running argument with alliance-mate Ben Booley about the Neddon versus the Mega Navy Issue. I reluctantly agreed that the Mega was slightly superior, mostly because the thinner Mega could cut through the Neddon armor before it went down. The balance will be tipping to the Neddon's favor for Odyssey. #5: Apocalypse Navy Issue. I'm conflicted about this one. Like its T1 counter-part, I'm not a big fan of the changes in cap and I think it renders this one too close to the Abaddon in capabilities, performance, and cost. The buffs to mass and signature, while nice, are not going to off-set the usability issues. The tracking bonus worries me. 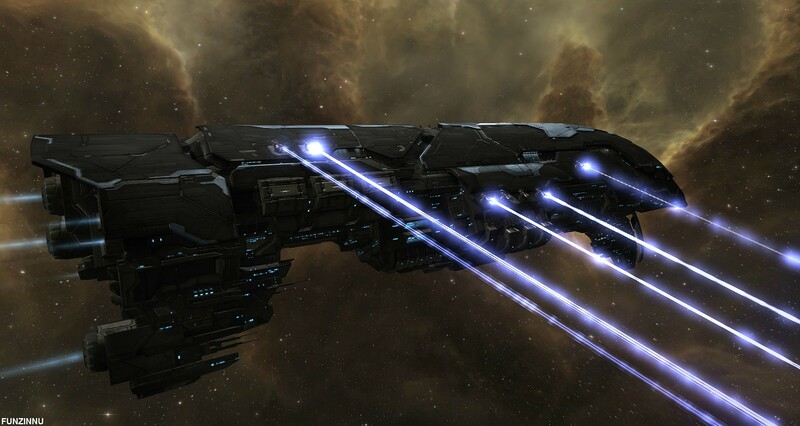 Every Amarr BS these days fits double Tracking Computers so that opens up the very real possibility that Napocs will be blapping inties right off BS fleets. The changes particularly hurt mid-range L4 mission-runners who rely on the Napoc's cap stability in all regimens. If they could fit a full rack of Tachyons that would be one thing, but unless my math is wrong, they can't without the same fitting mod they need today. Again, I'm conflicted about this one. It's too good in some ways, too weird in others. I can see what the intent was here, but it needs more tweaking, IMO. #6: Dominix Navy Issue. This one falls firmly in the middle. I'm a huge fan of the throwback nature of the beast (it has this in common with the Neddon). The buff to power grid is quite nice, which are going to make Neutron DNIs quite achieveable. But the biggest buff is to calibration, which is going to make fitting that T2 Sentry Damage Augmentor rig possible. Alternately, for PvE applications, double CCC/Sentry Damage Augmentor rig setups will also be possible, which is going to free up a mid slot for any number of possible uses. #7: Tempest Fleet Issue. Like the Tempest, the TFI was slightly over-powered relative to the others so it doesn't surprise me to see it's the least changed. The slight tweaks to fitting will be welcomed by newer players who are using this ship. I wonder who those might be? #8: Megathron Navy Issue. While I love love love the mass decrease, I don't understand the decrease in base armor, and I'm quite sad about it not receiving the 5th mid slot that its T1 counterpart will be enjoying. The ROF bonus will make it an even more withering attack platform and as such it's a distinct improvement over the current model. But most improved compared to the other seven it is definitely not. In the unlikely event it gets that 5th mid slot, jump this one up to #3 or #4 but someone has to be on the bottom and right now this one's it. EDIT (17/May/2013): Fifth mid-slot also appears to be out for the T1 Mega. Boo. So, that's where I fall with the navy battleships. Where am I wrong about this list? What did I get right? (1) T2 frigates comes closest. I've flown every T2 frig in the game except the Helios. T1 BCs comes second closest. I've flown all of them except the Myrmidon.